I nearly fell at the final hurdle with Vogue 1073. 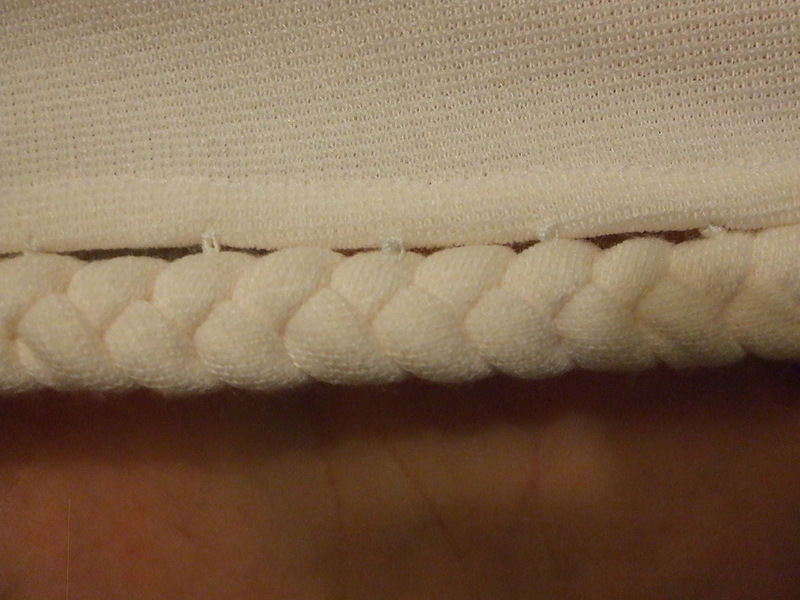 The hem is finished in a really unusual way that calls for ‘buttonhole twist’ thread. I’ve heard of this stuff as fairly thick, shiny thread used to make hand-worked buttonholes but never seen it in a shop. A quick internet search didn’t turn it up in any online shops in the UK. What you use the buttonhole twist for is attaching a plaited braid to hang from the bottom of the dress hem, using a hand-sewing stitch that resembles a series of french knots. The braid is made out of the same fabric as the dress. The stitches attaching the braid clearly show on the pattern envelope photo, although I don’t think they’re very visible in this electronic version. 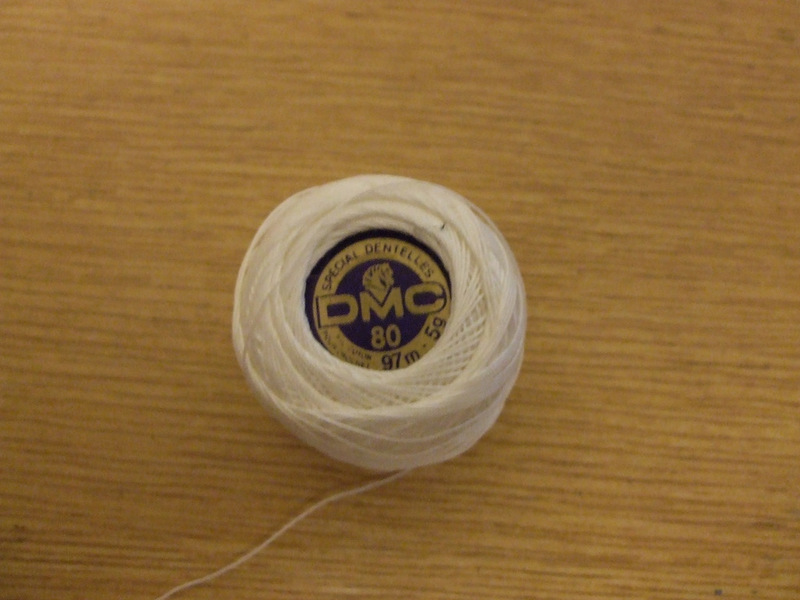 I was thinking of buying some embroidery floss and trying to use a single strand of that, but then I remembered I had this DMC Special Dentelles 80 thread left over from when I used to do lacemaking. It’s thick and slightly glossy thread with very little elasticity. It seemed to work OK for attaching the braid, although I think it may be slightly thicker than whatever Vogue used. Amazingly there are no bloodstains on the hem, despite my having rammed a needle into my finger while sewing the braid on. I am not good at hand sewing. This whole project has been pretty hard on the fingers. You can see the funny little knots attaching the braid in this picture. The braid is definitely meant to be attached below the hem rather than on top of it according to Vogue’s diagrams. So that’s the dress done at long last! I haven’t got pictures of it yet because the nights here are drawing in so fast there’s now no daylight left by the time I get home from work. Hopefully I’ll get some at the weekend. Posted on October 5, 2011 October 8, 2011 by catherinedaze	This entry was posted in dressmaking, sewing, Techniques, vogue, Vogue 1073 and tagged dressmaking, hemming, sewing, thread, vogue, white. Bookmark the permalink. Argh, I can’t believe you’re leaving us hanging like that!!! 😉 I can’t wait to see it. The braid trim looks so lovely!!! Great dress! I can’t wait to see the photos. A good tailoring supply store (where they would sell things like buttonhole twist) in London is Kenton Trimmings on Mozart St. They have anything you could want, but it’s all behind the counter. You have to ask for what you need. No browsing. And you need to learn how to use a thimble. You used to make lace!?!?!?!?!?!??! *WOW* That is an incredible art form. I love staring for hours (well, minutes, really) at the handmade specimens in the Textile Gallery at the Royal Ontario Museum. I never realised there was that hem detail on the dress, it looks really lovely, now when can we see the whole dress!?! Wow- you are a major trooper with that hem! Pictures soon, please!